German banker; born at Parchim, Mecklenburg-Schwerin, Jan. 14, 1765; died at Hamburg June 4, 1835. He acquired by private study not only a high degree of general culture, but also a thorough knowledge of nine languages, ancient and modern, supporting himself at the same time by teaching. He subsequently went to Hamburg, where he became bookkeeper in one of the larger banking-houses. He soon founded a bank himself and accumulated a considerable fortune. Although not unfavorably disposed toward Reform, Fränkel opposed the introduction of Eduard Kley's German hymn-book, considering it too radical a departure from the past of Judaism. With M. J. Bresslau, heading the Reform Tempel Verein, he issued a prayer-book, the "Ordnung der Oeffentlichen Andacht" (Hamburg, 1819), in which Hebrew prayers were interspersed with the newly introduced German hymns. 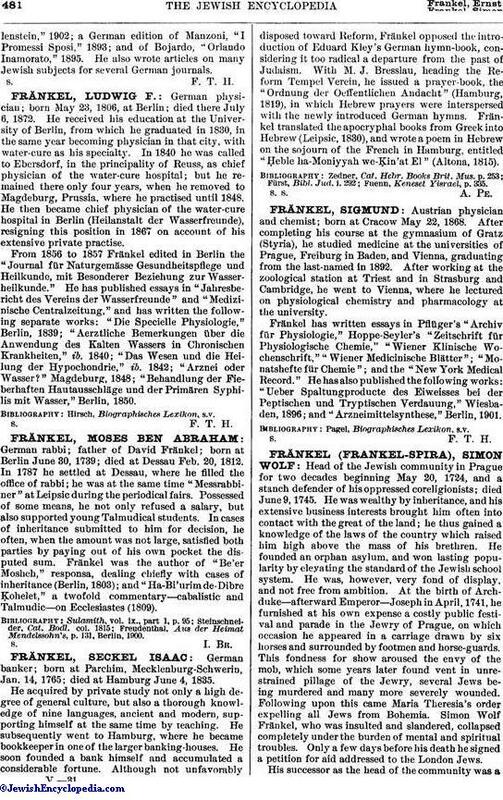 Fränkel translated the apocryphal books from Greek into Hebrew (Leipsic, 1830), and wrote a poem in Hebrew on the sojourn of the French in Hamburg, entitled "Ḥeble ha-Moniyyah we-Ḳin'at El" (Altona, 1815). Fuenn, Keneset Yisrael, p. 335.